Porters Gin is a popular Gin available from Amazon.co.uk in 70cl to buy online. Visit Amazon.co.uk for the best price for 70cl of Porters Gin or compare prices on our other Gin products. This gin is elegant with juniper at the forefront and good earthy depth with fresh citrus top notes enhanced further by fragrant buddha's hand. On the palate, juniper is at the heart of proceedings, as it should be, supported by warming pink pepper, cinnamon and anise with citrus never far away. This gin comes from Aberdeen in the north east of Scotland. This gin is ideal as a pre-dinner drink. 41.50 percent This drink is best served with ice. 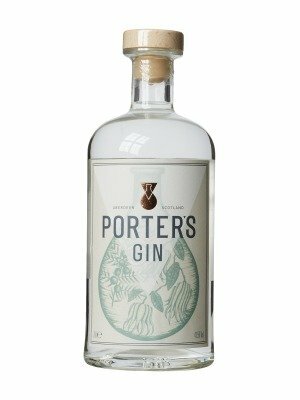 Where to buy Porters Gin ? Porters Gin Supermarkets & Stockists. You can buy Porters Gin online in most retailers and find it in the Gin aisle in supermarkets but we found the best deals online for Porters Gin in Amazon.co.uk, TheDrinkShop, 31dover.com, and others. Compare the current price of Porters Gin in 70cl size in the table of offers below. Simply click on the button to order Porters Gin online now.